Wood garage doors are affordable and easy to care for. With all the different types of garage doors available, the most popular doors still being made are the wood garage doors. Affordability and architectural design are the biggest selling points of a wooden garage door. 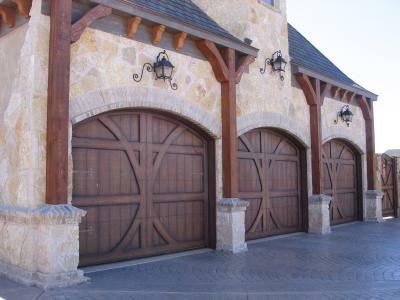 There are two basic types of garage doors made of wood: roll up garage doors and tilt up garage doors. Roll Up Sectional Garage Door - Roll up garage doors are typically made of four or more sections mounted horizontally and hinged together with rollers in a track that rolls the door straight up and back. The roll up sectional door is safer than a tilt-up door and can be opened with a car parked directly in front of the door. And because the sectional door fits behind the door opening, it will make a tighter fit than other styles that are mounted inside the door opening. Tilt Up Garage Door - When opening a tilt up garage door, you will notice a difference in how the door opens. This type of garage door fits inside the door opening and is a single panel that tilts out and up. Costing 25 to 35 percent less than a sectional door, tilt up doors are very cost effective. It should be noted, however, that you cannot open this style door with a car parked directly in front of the door. Being able to purchase standard garage doors made of wood at almost any home improvement warehouse is wonderful, but if you want a more decorative and stylish garage door you will have to get in contact with the garage door manufacturer you have chosen. Most manufacturers will be able to do just about anything you want as far as the design of your wooden garage door. Carriage Doors - This type of door looks like an old carriage house door. It will add charm and curb appeal to almost any home. The possibilities are endless with this style garage door. A carriage door looks like it slides open, or swings open, but it really opens just like a sectional roll-up garage door. Barn Doors - These are designed to look like a barn door and function like a garage door. This type of garage door will also look as if it slides or swings open, but it really opens like a sectional wooden garage door. Annual Maintenance - The working parts of garage doors made of wood should be checked on a yearly basis. Inspect hinges, rollers, springs and other hardware. Lubricate all moving parts with a household lubricant. If you are experiencing problems with the springs or operators, it is best to contact a trained professional. A properly balanced door should be able to be stopped halfway open and not drift up or down when opened manually, and should also open and close smoothly when used with a garage door opener. Biannual Maintenance - Because wood expands and contracts with changes in the climate and weathers, it will demand more regular maintenance. Repainting or refinishing every two to three years will help to extend the life of any wooden garage door. Prices and the availability of customization can vary dramatically, so it is a good idea to evaluate all of your different options and comparison shop before making any final decisions.